New Web 2.0 services — Pinterest, Google+, Tumblr, and plenty more — are driving traffic to websites, building new businesses, and propelling a shift in the way people do online marketing. Here’s all you need to know about how these new social properties can help your traffic grow. A few years ago, the phrase “Web 2.0” heralded a revolution that resulted in a largely “social” web. User-generated content became an integral and defining part of Web 2.0. In the wake of that revolution, we discovered popular services like Blogger, WordPress, Orkut, MySpace, Facebook, Friendster, and of course, Twitter and other content platforms. Today, most of the Web 2.0 properties are thriving successfully amidst notable newbies, and the ecosystem has transformed completely. The most striking fact about all these Web 2.0 properties is that they’re powerful sources of traffic, engagement, and brand marketing. 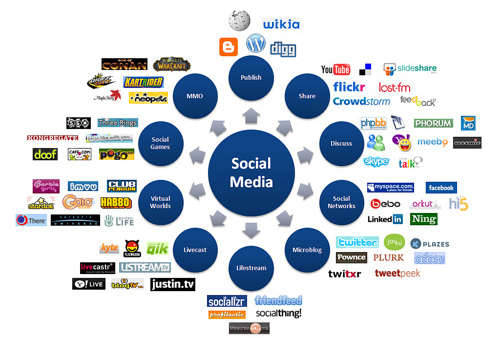 Social media — the current Web 2.0 — is much more than a mere framework into which communities are built or where interesting content happens to be shared. Large companies are making optimal use of these social properties to establish businesses, increase their following, promote themselves, and ultimately, generate enormous revenue through traffic and conversions. By now, you’ve probably heard people talk about how important it is to have a Google+ profile or a Pinterest profile. Much has been written (and continues to be written) about social media, its power and influence on rankings, traffic, and business in general. Website owners, Search Engine experts, and even other businesses that desperately seek a traffic-surge to their websites in order to increase their revenues need to take social media marketing ever more seriously . . . because this is the age of the new Web 2.0. The problem with experts who write about social media is that most of them make it look difficult and costly. The truth is, it doesn’t have to be. The key component of social media marketing is valuable content. Without content that’s useful, no social campaign can work. But with the right content, you can conjure magic. Unlike most traditional marketing and organic traffic, social media marketing is aimed at communities of like-minded people. It all boils down to communities and groups — a collection of motivated individuals. Your efforts must be tailored toward communities. That means you’ve got to be specific and focused, and do a decent amount of market research. Engagement is an important measure of how successful your social campaign has been. If you can evoke customer responses and emotions, you’ve leveled up. With that in mind, let’s take a look at the most successful social properties that have helped websites and businesses achieve their goals. When Google+ first launched, people thought it was a lame attempt to clone Facebook. I suspect quite a few people still regard it as a desert even today, but that’s not what websites like Mashable think. A lot of news organizations I think fall under the trap of just seeing social networks as broadcast platforms for their content…. With Google+, I think that we have a lot of opportunity to take advantage of the cool features that the platform has, and really do more engaging projects rather than just posting our stories. One great thing about Google+ is that it integrates Twitter’s #hashtag feature into its ecosystem, which makes it easier for discovery, visibility, and engagement. Many businesses have established Google+ pages to reach their customers better; the profile page serves as a large source of traffic through curated content sharing and engagement. If you haven’t got a Google+ profile for your website/business, it is time to get one. And there’s one other important reason to do so: rankings. Google certainly values the number of shares that a particular story/link gets in order to evaluate it for search engine rankings. In the coming years, we can take that as a strong factor/metric of search engine ranking. Unlike Blogger and WordPress, where the focus was largely on a content-publishing platform, Tumblr integrated blogging with the concept of community. It was more about a lot of people than about a lot of traffic. Today, Tumblr publishes several million posts every day. Personally, I’d vouch for Tumblr more than Blogger or other blogging platforms because the user-base is both dynamic and active. Tumblr’s options like reblogs and tag searches are valuable. And most important, Tumblr is an authority website that can drive your rankings up. This case study roundup discusses how brands are using Tumblr to size up customer interaction, boost traffic to their websites, and ultimately, increase their revenues. Pinterest has generated a lot of attention, discussion, and analysis. As Pinterest’s case studies prove, businesses are being established through Pinterest. An infographic from Shopify puts Pinterest at #3 in driving sales, which ties it with Twitter — another sterling example of the power of communities. Much like Tumblr, Pinterest is driven by interesting content from the users: re-pins as compared to reblogs. Images take the lead here, too. But what separates Tumblr from Pinterest is that the service possesses the ability to direct traffic to your website instantly. While Tumblr is more of a content platform, Pinterest serves as a link. Facebook and Twitter, these days, are usually off-limits: they are the clichéd social websites covered in a million posts about social media marketing. While I left Facebook out of this post, Twitter deserves a special mention. And that’s because Twitter appears to have exerted some very strong influence on rankings. Social signals from Twitter have been shown to benefit websites in the SERPs. Twitter is an established microblogging platform that has turned into a large-scale social campaign tool for plenty of websites and businesses. Besides providing a wonderful network to promote engaging user-driven content, Twitter has helped increase web traffic and search rankings too. LinkedIn is well-known for the value it brings to B2B marketing. However, it also has a proven track record of increasing traffic to websites. A continuous presence on LinkedIn’s various platforms like Groups, Answers, and Company Pages has helped websites like BusinessInsider.com drive a ton of traffic to their site. Among popular social media websites, LinkedIn isn’t often accepted into the fold of traffic-generating websites, but LinkedIn can actually drive a lot of traffic. If your marketing is geared toward B2B, LinkedIn should be your starting point. If you want to add LinkedIn to your marketing efforts, here’s the Ultimate Guide to LinkedIn Marketing. Social media is not just a place to hang out these days. It’s the next big thing for organic traffic, engagement, and branding.